IISER Tirupati is organizing a 5-day workshop on Data Analysis and Machine Learning, jointly with IUCAA, Pune, during May 24-28, 2019. The workshop is at an introductory level, meant to train young researchers and students in the recent techniques of data analysis including statistical analysis, nonlinear time series analysis, recurrence plots and networks, Bayesian approaches, machine learning algorithms and deep learning methods. In addition to introductory lectures there will be hands-on sessions every day and participants will be trained in the use of data sets form various research areas like astrophysical data, cosmology data, experimental data, financial data, biological data, physiological data, climate data etc. The number of participants is restricted to 50. A nominal registration fee of Rs 6000/ is to be paid by each selected participant at the time of registration. 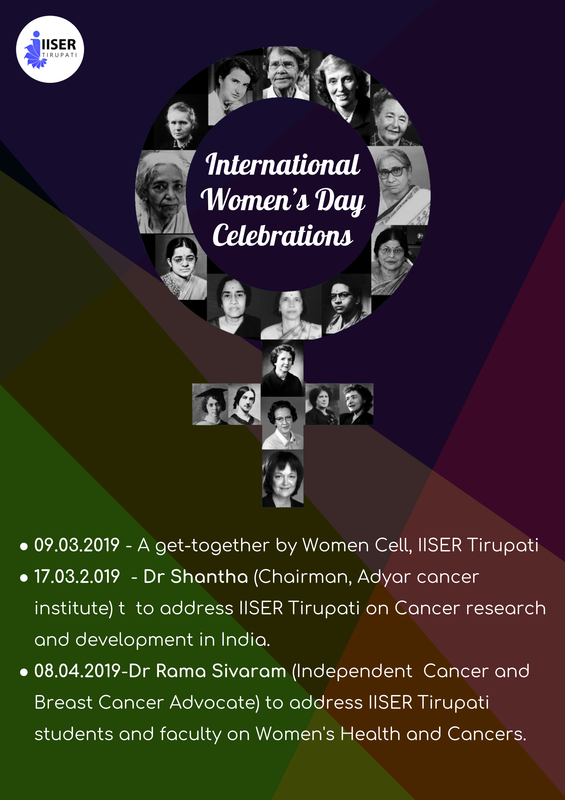 IISER Tirupati is hosting a training event in collaboration with the IISER Bhopal, to help students and researchers analyze the genomic data they collect. This workshop is designed to enable students to use different bio-informatic pipelines for ecological and evolutionary research. IISER Tirupati is hosting a training event in collaboration with the Cornell Lab of Ornithology, to help students and researchers in bioacoustics. Our industry collaborator for the event, Wildlife Acoustics Inc will demonstrate and train students in analyses of long-term acoustic data. Limited seats are available for registration. Physics Day-2019: A one-day symposium was conducted at IISER Tirupati on 5th Jan 2019 to showcase the research fields at Department of Physics. Prof. P. S. Anil Kumar from IISc gave lecture 'LEGO with 2D materials'. The program contained talks and poster presentations from different research groups. We are proud to announce the inaugural edition of the Intercity Number Theory Seminar, scheduled to be held at IISER Tirupati from 17-18 Dec, 2018. The Intercity Number Theory Seminar is a two-day seminar, which is initiated by Mathematicians from IMSc, CMI, IIT Madras, IISER Tirupati, and IIT Tirupati, who are working in Number Theory and related areas. The Seminar will take place twice a year. Average duration of monsoon rains over 22 cities of India. Indian economy is very sensitive to agronomics that is heavily depends on the monsoon rainfall. Hence a slight change in monsoon rainfall pattern affects the nation‘s GDP. Most of the regions in India receive more than 75% of their annual rainfall during the southwest monsoon season i.e., between June and September months. The knowledge of duration of this monsoon rain is very important for water management and urban planning. The major urban flooding events and their damages have been seen in Mumbai, Srinagar, Chennai, and Gujarat in recent years and in Kerala during the month of August 2018. 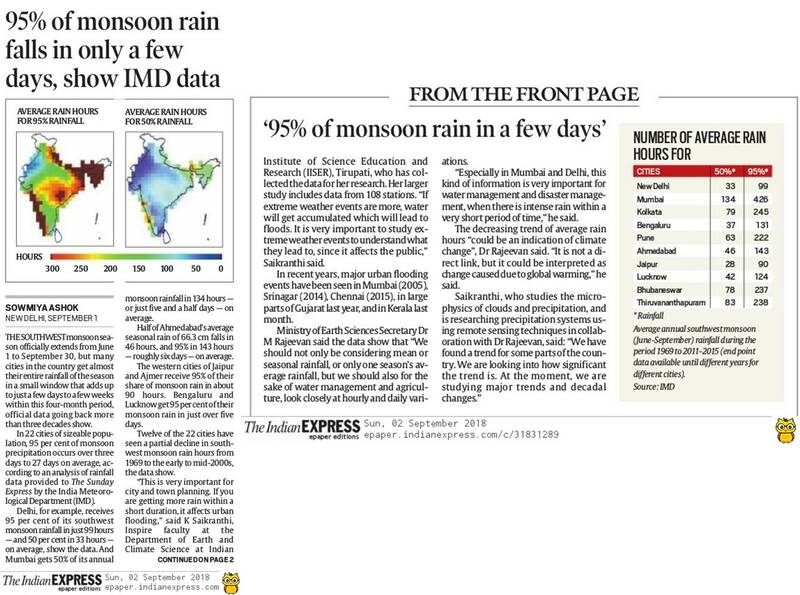 In this regard, the average rain hours during the past three decades for 50%, 95% monsoon rainfall over different cities of India are studied using hourly rainfall dataset collected by the India Meteorological Department. Scorpion is known for its painful sting. Relatively less known fact is that the scorpion venom, world’s most expensive liquid (~10 million USD/Litre), is enriched with many important natural products, which can fight cancer and autoimmune disorders. Recent study by Shibdas Banerjee et al. has reported a new alkaloid from the scorpion venom, while most venom components identified in past are peptidic or proteinic in nature. This news has surprised the world and recently mentioned in Chemical and Engineering News (C&EN). The study was conducted in collaboration with the laboratories of Prof. Richard N. Zare, Stanford University, and Prof. Lourival D. Possani, UNAM, Mexico. Scorpions use their venom to paralyze their prey. However, this alkaloid was not found to have insecticidal activity. The exact role of this alkaloid in the venom is still a mystery. A chemical method of synthesizing the alkaloid has also been developed. Authors suggest that this venom alkaloid might be of potential interest for evaluating its medicinal effect. Prof. D. S. Nagaraj joins IISER Tirupati as professor and chair of Mathematics. [Aug 2018]Prof. D. S. Nagaraj joined IISER as Professor and Chair of Mathematics. Prof. Nagaraj was working at Institute of Mathematical Sciences at Chennai. He is a Fellow of Indian Academy of Sciences and Indian National Science Academy. He is well known for his work in the areas of algebraic geometry and vector bundles. The Prime Minister’s Research Fellowship (PMRF) scheme is for attracting students for PhD program for carrying out research in cutting-edge science and technology domains, with focus on national priorities. Now all IISER institutes are also included within this scheme. Previously, only IISc and IIT's were under the scheme. For more information, please visit the PMRF page (https://pmrf.in/). Prof. G. Ambika joins IISER Tirupati as a Professor of Physics with her deep knowledge and experience in the area of Non-linear Dynamics. iConChem 2018 was the first International conference in Chemistry conducted by IISER Tirupati from May 24th to 26th, 2018. It brought together an outstanding and diverse group of scientists at the forefront of research in chemistry and allied disciplines with a focus on participation by younger scientists and students. Topics covered in the conference include chemical biology, organic chemistry, inorganic chemistry, and theoretical chemistry. Prof. B J Rao brings enormous experience in research and administration from TIFR to IISER Tirupati joining as a Senior Professor in Biology. Professor Basuthkar Jagadeeshwar Rao has joined IISER Tirupati as a Senior Professor in Biology with effect from April 2, 2018. Prof. Rao was a Senior Professor of Biology at TIFR Mumbai. He will be the Chair of Biology at IISER Tirupati. Prof. Rao obtained his BSc from Nizam College and his MSc from Osmania University, Hyderabad. He then obtained PhD from Indian Institute of Science, Bangalore in the domain of Biochemistry. He did his post-doctoral work at Yale Medical School where he served as a research scientist for about seven years, before returning to India and joining TIFR, Mumbai. He has served TIFR in various capacities, from being a reader to Associate Professor, Professor and then Chairperson of Biology. He leads a research group on Mechanism of Genome Dynamics and Cellular Adaptations Laboratory at TIFR. His areas of specializations are the molecular basis of genome dynamics, the computational biology of genomes and protein active sites, cellular physiology and metabolism, to which he made fundamental contributions. Apart from his fundamental research in the domain of biology, he is also interested in the dissemination of scientific knowledge and outreach activities. MoU signed between IISER and The University of Newcastle. On 16th February 2018, IISER Tirupati has signed Memorandum of Understanding (MoU) with The University of Newcastle Australia. The MoU was signed by Prof. Kevin Hall, Senior Deputy Vice-Chancellor (Research & Innovation) and Prof. K. N. Ganesh, Director, IISER Tirupati. IISER Tirupati was established in 2015. The University of Newcastle is an Australian public university established in 1965, with its main campus in Callaghan, a suburb of Newcastle. Both the institutes are committed to academic and research excellence. The collaboration between these two institutes will strengthen education and research in future. This MoU will facilitate close collaboration between researchers, and the exchange of students and researchers. It will also help to have joint research proposals and joint PhD students between faculty in the two institutes. Particularly, both the institutes have agreed upon cooperating in the design and development of advanced materials for energy and environment applications. IISER Tirupati and Indian Institute of Technology (IIT) Tirupati jointly organised the Topical Conference on "Quantum Collisions and Confinement of Atomic and Molecular Species and Photons"e; during 6-8, January 2018. The Indian Society of Atomic and Molecular Physics (ISAMP) is an organization of researchers in India working in the broad field of Atomic, Molecular, and Optical Physics. It was formed in 1975 at Ahmedabad, with the purpose of bringing together the atomic physicists in India. It has grown in size and scope, from a handful to a few hundred, with a wide variety of problems being addressed in Atomic and Molecular Physics. The major problems dealt by the community involves structure and dynamics of atomic and molecular systems, the interaction of light with matter, trapping and manipulation of quantum systems, etc. The Society holds a biennial national conference alternated by a biennial topical meeting.